As Halloween fast approaches, we are looking for more fun and inexpensive decoration ideas for parties and events. Our friend Katie F. is back again this week with another of her nifty easy decoration crafts. 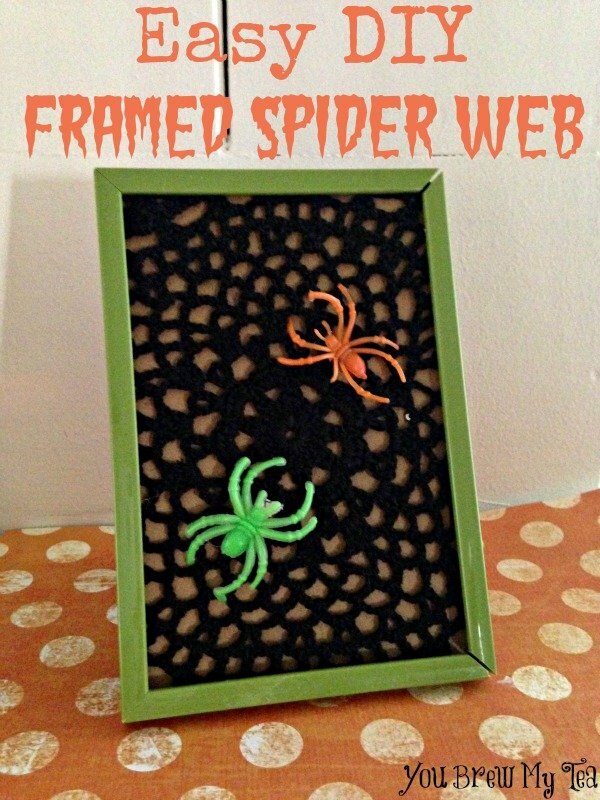 This Easy DIY Framed Spider Web is so simple and easy to put together! It’s a perfect craft to make with the kids, and great for decorating parties & walls at your own Halloween events. We love how inexpensive it is, but mostly how cute and easy it is to customize! Check out this great Halloween craft and gather the supplies to make one or a few of your own! Begin by painting your frame with two coats of craft paint. This of course is optional, as you are free to use your frame as is. You may also use spray paint for this step if you wish. Remove the glass insert to the frame and recycle or discard it. You will no longer need it for this project. Cut the doilie to fit over the cardboard insert of the frame. Stretch it over the insert, and place the insert back into the frame. You can help it better adhere to the insert by taping the back or using a few dabs of glue. Add a dab of glue to your plastic spiders. Place them on the doilie web, pressing firmly as you do. You can use as many or as few as you wish, depending on the size of your frame. See how simple that was? It’s a great craft to do with preschoolers and grade school kids too! Simply remove the glass from the frames ahead of time to prevent any risk of it breaking and cutting someone. We love the idea of using other Halloween themed items along with the spiders. Mini pumpkins, candy corn shaped toys or even cutting apart your classic brightly colored Mardi Gras beads and gluing to the frame would be great. You could find some cheap craft letters and monogram it too if you wanted! Thanks to Katie Fermia for making this great tutorial for us to share with you! Make sure to check out her author page for more about our craft loving friend! Don’t forget to check out all of our great Upcycle & Easy DIY Crafts! For more great Halloween Decoration & Treat ideas make sure to follow us on Pinterest and check out our Halloween Board! So simple, so fun. I’ve never seen cheap plastic spiders look so good before!